Jason Gillespie identified batting collapses in both innings as the key reason Sussex lost their county championship opener to Leicestershire at Hove. 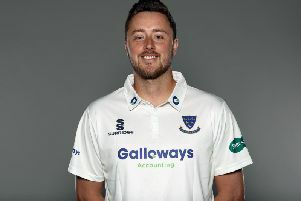 Sussex lost early wickets in the first innings - then four quick ones after a good start to their second knock - as the men from Grace Road claimed victory by seven wickets on the afternoon of the final day. Gillespie said: "It’s disappointing. We hung in but when you find yourself 38 for 5 on the first morning and under the pump it’s very hard to come back from that. "Then on the third morning we lost four for 21. If we’d got a few more runs we could have made it really challenging but fair play to Leicester, they played well. "There were two occasions when we lost wickets in clumps and our batters need to identify those periods and adapt when the opposition are bowling really well. It is something for us to learn from – that is the challenge, to continually reflect on team and our individual performances." Paul Nixon, the Leicestershire coach, said: "I’m incredibly proud, it was a really good team performance. From the moment Tom Taylor stepped up and got that wicket with the fourth ball we were excellent. "Paul Horton led from the front, Hasan Azad played beautifully and Mark Cosgrove looks in a special place, he looks like an international cricketer after he had a tough 2018 – there were so many positives for us. "The calmness with which we went about our business was really pleasing, we looked a different outfit. We had total belief that we are going to win that game. "It will give us enormous confidence. Man-for-man, I believe we are as good as any team in division two and no county has worked harder this winter. We’re in a good place. It’s a long season but we’ve made a really positive start."